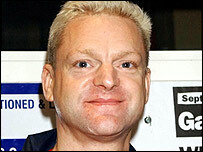 Erasure singer Andy Bell has revealed he is HIV positive. The star told a Finnish newspaper he was diagnosed six years ago after falling ill on a trip to Majorca. "I found out I was HIV positive in June 1998 when I had a bout of pneumonia in Majorca," the 40-year-old singer said in a statement on the Erasure website. "Being HIV does not mean that you have Aids. My life expectancy should be the same as anyone else's so there is no need to panic." Since his diagnosis in 1998, the Erasure star has been taking combination therapy. "I am feeling fine - in fact I have never felt better," he told fans, thanking them for their concern. "There is still so much hysteria and ignorance surrounding HIV and Aids - let's just get on with life, ie making music, doing a live tour and generally having a good time," the statement said. Paul Hickey, who has been Bell's partner for the past 20 years, has written about the singer's condition in a book due to be published next year. Erasure, a two-man group made up of Bell and Vince Clarke, will release a new album, Nightbird, in January. They are due to embark on a European tour next year. "With Andy's recent successful hip replacements, he is in better shape now than he has been for some time and we can certainly expect to see an outstanding performance from him next year," the website continued. Erasure have been on the music scene for 20 years. Chart hits include A Little Respect, Sometimes and Ship of Fools.